Recto: a study of a torso of a man, seen from behind, with the muscles strongly marked; on the left is a similar study, but only the right half of the body and the right arm are shown; notes on the drawings. Verso: three studies of the neck and thorax, showing the ribs, the internal intercostal muscles in one, and the external intercostals in two; with notes on the drawings. 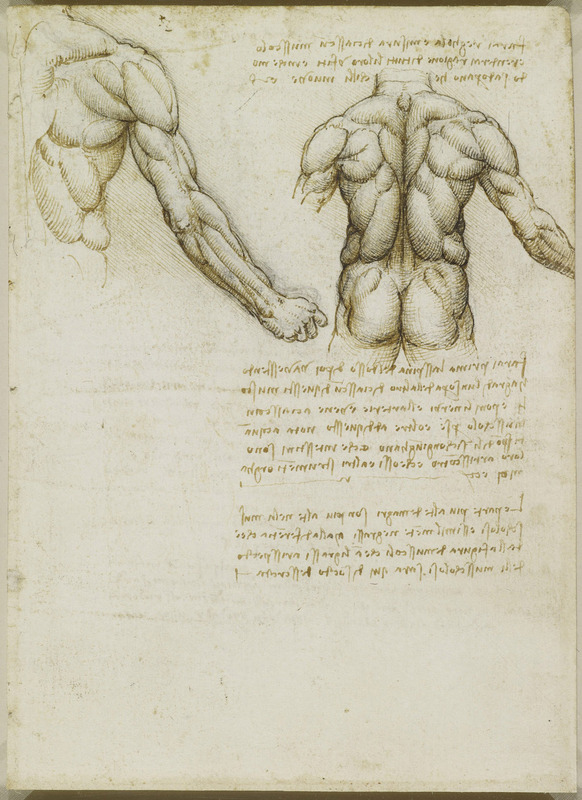 Leonardo's anatomical studies were usually picked out for special mention by early commentators on the Leoni album, and a number of Hollar's etchings reproduce those drawings. This study (RCIN 919044 recto) of the musculature of the back and arm, based on human dissections carried out by Leonardo in the hospital of Santa Maria Nuova in Florence, was etched by Hollar in 1645. Like many of his anatomical observations, the drawing is accompanied by Leonardo's notes, written in his characteristic mirror-writing, but Hollar did not attempt to reproduce that script in his etching: it is likely that the exaggerated nature of the drawing, almost to the point of the grotesque, would have appealed more to Hollar's market than the scientific nature of the study.